The commercial cleaning crew here at Midwest Janitorial Specialists, Inc takes great pride in creating and maintaining gleaming hard surface floors in Blue Island, Illinois. Floor stripping and waxing is what we do best! We've been stripping, waxing and buffing floors to perfection since 2010. Give us a call at (630) 273-7233 today for a free, no obligation assessment of your flooring and a fair and honest quote for maintaining it. Whether you are looking to spruce up a tired, neglected marble floor, or your Blue Island VCT tile flooring is buried under layer after layer of wax, Midwest Janitorial Specialists, Inc can get your flooring back to a shiny, clean state. Regularly maintaining your flooring in Blue Island will keep them looking fresh and clean, and will extend their life. 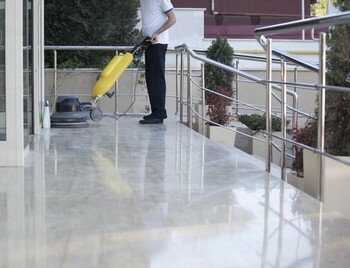 Marble and Granite must be regularly dust mopped and cleaned with mild detergent. Regular buffing or burnishing will keep them gleaming. Depending on the foot traffic you endure, we'll get you set up on a maintenance schedule best suited to your needs. VCT flooring should be stripped and scrubbed to remove old built up wax, then dried thoroughly prior to an application of fresh wax. Again, depending on the amount of traffic you receive, we'll maintain them, daily, weekly, monthly or quarterly, to your specifications. For expert commercial floor stripping and waxing in Blue Island, call the pros who pay attention to the details at Midwest Janitorial Specialists, Inc today!